Nick Churton of Mayfair International Realty took a step closer to heaven when he visited a magical realm only an hour away from Manhattan now being sold through Houlihan Lawrence. Musical prodigy and one of Hollywood’s all-time most celebrated and talented composers, Marvin Hamlisch, left some wonderful scores and memories when he tragically passed away too young just a few years ago. But he had one creative project that, until now, was known only to his family, friends and close collaborators – his house. Every inch of this exquisite home was carefully planned or commissioned by Mr Hamlisch – it must have been a labour of love. It was his composition, his magnum opus in property. 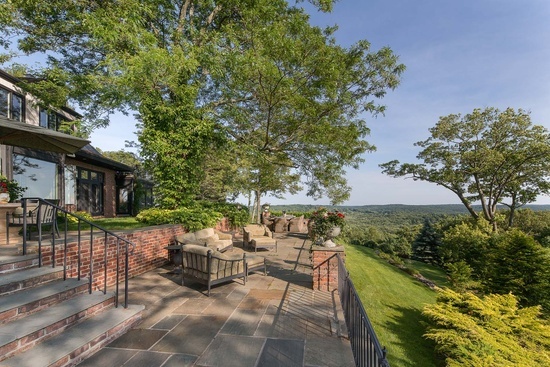 Without doubt some inspiration for it all must have been the beautiful 4.6-acre hilltop location in Bedford, New York. It is magnificent. From here one can see three states, New York, New Jersey and Connecticut. To the far north across the Hudson Valley are the Catskill Mountains. Nearer at hand are hundreds of square miles of wooded hillside that in autumn turn into a riot of russet. And sometimes, when white clouds softly blanket the valley below and all that can be seen are the surrounding hilltops, this place becomes ethereal. But come inside this house of peace, serenity and revival. Poggenpohl and Porsche helped out in the kitchen. The paint shades are calming greys. All is comfortable, soft and inviting – not too large or too small. There are areas for solitary relaxation and spaces for warm conversation and convivial dining – inside and out. And of course there’s an area for music. From just about everywhere are the views. I was especially lucky when I visited the house that the Hamlisches came to call Magic Mountain. I had the great, great pleasure to be escorted round by Mrs Hamlisch – surely her husband’s main inspiration for this house. It was a space they developed together, coming to value and love this wonderful home in its commanding position. They also came to love their neighbours – a delightful and eclectic mix of friendly and leading musicians, actors, business people and creatives. It is not hard to see why this area is so prized by those who guard their privacy but need to get to New York City almost within the hour. There are several very fine houses hereabouts to choose from. But I doubt that there is anything quite like this little piece of paradise. At the top of this hill it is just about as close to heaven at home as one can get.